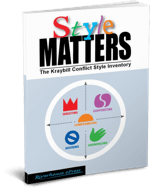 Style Matters eases the dilemmas of limited trainer time. 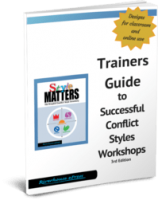 Reduce prep time - and stress - with our detailed Trainers Guide to Successful Conflict Styles Workshops. If you've got basic group facilitation skills you can quickly design an effective workshop and get it right, the very first time. Download it free now! Work with multiple users as easily as with individuals. Our user-friendly Trainer's Dashboard gives you the option to register users, monitor useage, view score reports and more in one location. Do it all face to face, do it all online, or blend the two - our diverse formats free you up to choose. Demo of dashboard here. 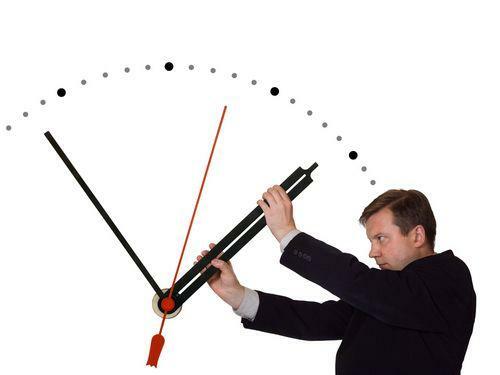 Delegate time-consuming activities to outside the classroom. Have users take and score the inventory before class, view an online Intro to Conflict Styles slide presentation, or work through a self-guided indepth tutorial on conflict styles. When time constraints are severe, assign all the above to pre-class work and devote 100% of classroom time to group discussion and personal reflection. See Trainer Support products below. Seven Tips for Building Conflict Resolution Skills When Training Time or Access to People are Limited. If you currently use the Thomas Kilmann Conflict Mode Instrument, review this product comparison. 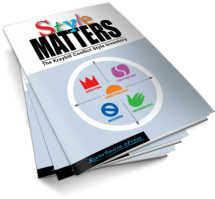 Read trainer testimonials about Style Matters. Get the tools now to focus on what you're really there for. Click on tabs and select tools perfect for facilitating learning in your context. $7.95 $6.95 - $10.95, depending on quantity and color or B/W. Minimum order: 25 copies. $9.95 for PDF, plus $3.95 per user to reproduce. Includes inventory, automated scoring, six page emailable score report with detailed suggestions based on scores. 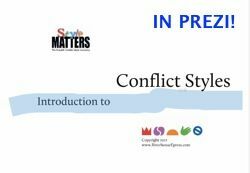 Tutorial includes handouts from Print version, plus short essays on Anger Management, Culture and Conflict Styles, etc. Inventory and support materials for a workshop. Inventory and support materials for a workshop. For solo use or requires trainer? For solo or trainer use. Tutorial provides full interpretation. Many trainers using the Online Version have users take inventory before class and bring printed Score Report to class; this saves class time for key trainer inputs and group reflection. Assumes presence of trainer. Assumes presence of trainer. Comprehensive, suited to all training circumstances, easy to use. Computer-generated report provides personalized tips based on scores. Optional Coupon Access and Trainer Dashboard put powerful user-management tools at your fingertips. Excellent for distance training. Some prefer the traditional hardcopy format. Available immediately via download. Lowest per user cost. If used solo without benefit of group reflection, users miss valuable experience of interaction with others. Available only in orders of 25 or more. Requires trainer input. Requires trainer input. Immediately after purchase; user can also login anytime thereafter. Allow up to 8 business days for arrival if shipping by standard rate. Expedited shipping available. Immediate. Option One: Trainer directs users to buy the Online Version directly from Riverhouse. Option Two: Access Code. If prepaying for users, trainer can be issued an access code to give users to login directly from our front page login. Infographic. Option Three: If prepaying for users, trainer can use our Dashboard (at modest add'l one-tiime setup cost) to register users and send them invitations to login and take the inventory and to track useage. Infographic. Riverhouse ships to trainer, who passes print copy to users. Riverhouse forwards digital PDF file to trainer. Trainer then prints out PDF and makes photocopies, paying $3.95 per user. The Print and PDF versions are identical. They include all materials required to support a workshop (a chart for tallying scores, an interpretive diagram, and handouts about each style.) 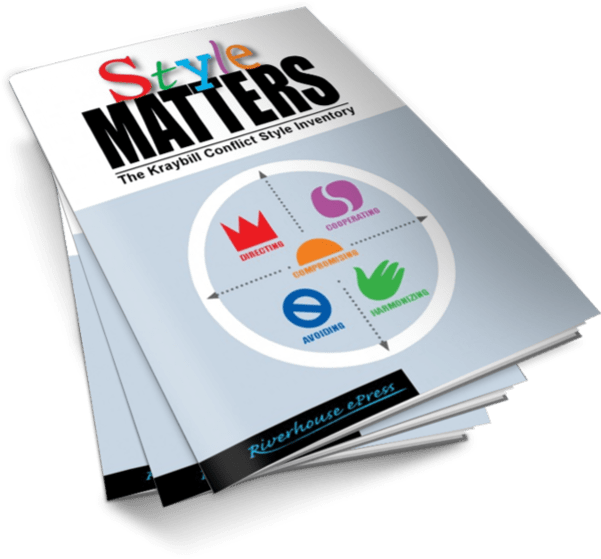 Download a free Review copy here or a free Trainer's Guide keyed to the materials here. 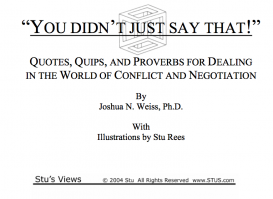 The Print and PDF versions assume the presence of a trainer to give input about interpretation. 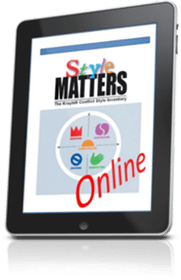 The Online Version can be used both independently or for a workshop. The Print version sells in minimum orders of 25 and arrives in about 8 business days via standard shipping (expedited available). View infographic with additional info on the various formats. 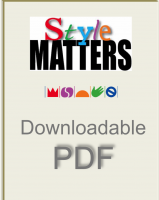 Detailed tips for supporting each style X Available at extra cost in auxiliary publications. Coupon Access allows trainers to setup easy login of pre-paid users. $7.95 full color $16.95 in packs of ten. Make your own photocopies from print copy or PDF file. Download PDF for $9.95. Buy rights to make photocopies as needed for $3.95 per user copy. Not available in PDF. Buy rights to photocopies from print version for $16.95 per user copy. $17.95 includes score report; no tutorial. Online Basic Training Course available for $225. 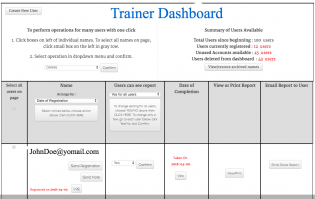 Online user management tools for trainers. 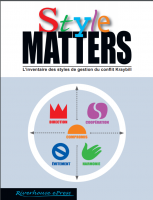 Information on Style Matters from www.ConflictStyleMatters.com; on Thomas Kilmann from www.CPP.com. Our goal is fair, accurate comparison. We would be grateful to be informed of - and will quickly correct - any points on which the above comparison is out-dated or does not meet these standards. View this on Slideshare. Comfortable with the basics of group facilitation? 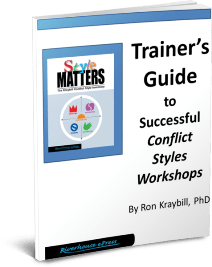 Then you can lead a successful conflict styles workshop! 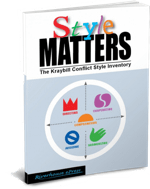 With this straightforward guide, anyone with basic group facilitation skills can lead a successful conflict styles workshop. 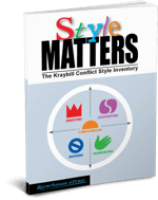 It packs years of experimentation into 20 pages of proven strategies for conflict styles training. Spend prep time polishing training design, not rough-drafting it! Download now - it’s free! 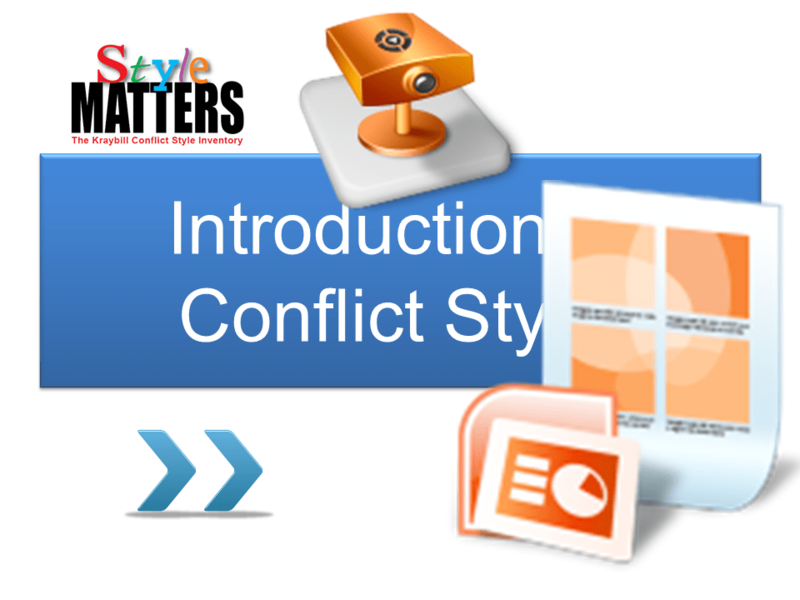 Overview of key concepts underlying the 5 styles-of-conflict framework. Ten slides in 2 minutes. Perfect to kick off the interpretation section of a workshop. View free on our site at any time or download and take it with you for only $24.95. 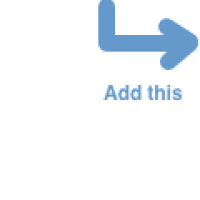 Similar to above, but in flowing Prezi format and 25% longer. View it free on our site or download and take it with you for $49.95. It's like Powerpoint with motion! 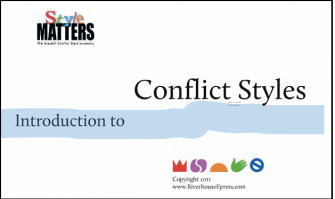 Annotated collection of online resources related to conflict styles and conflict resolution training. Topics include culture, gender, research, anger management, negotiation and problem-solving skills. Review it now and come back when you need it.